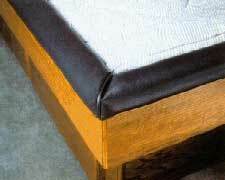 Having padded rail caps makes it easier to sit on the edge of the bed without discomfort and completes the look of your new waterbed. All of our padded rail caps come in 2 piece, 3 piece or 5 piece with a corner seat. Not sure which set is right for your bed? Call us toll free at 1-800-630-5889 and one of our experts will be happy to help! Available in Standard and Jumbo. 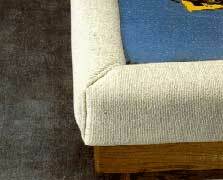 Jumbo rails have additional padding for increased comfort. Standard Color Choices are included in the price. 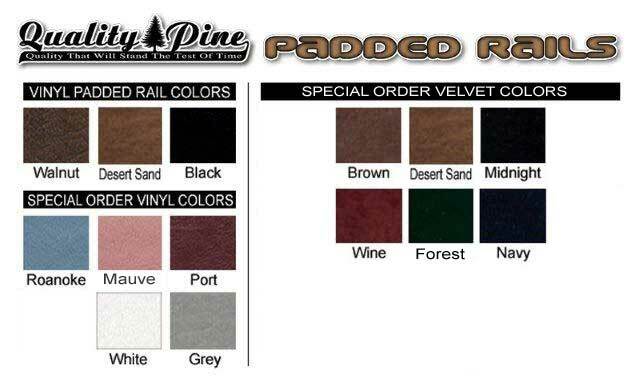 Special Order Color Choices-there is a 20 dollar charge. 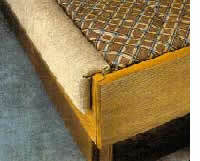 Note: Side Rails do not go the entire length of the bed to accomodate various size Bookcase Headboards. Please allow 2 weeks for rail caps to arrive as they are made to order. 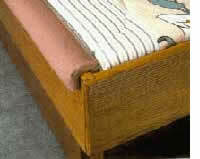 1-5 piece deluxe rail caps for hardside waterbeds.Choice of colors. 1-3 piece rail caps for hardsides waterbeds 2-Inside dimensions given. 3-order rails and make color choice at the bottom of page. 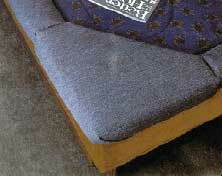 2 piece padded rail cap for waterbed. Many colors available. 2 piece jumbo rail caps for maximum comfort. Many colors available.